Sterling silver bead for the throat chakra. The throat chakra, or vishudda, is for communication, honesty and integrity. The opening of the bead is about 4.5 mm. The bead has hearts shapes around it and is equipped with a rubber stopper so it doesn't move around. The rubber stopper can be removed if you prefer it to move. You can purchase each of the chakra charm beads separately and add them as you go and change them out as you like. Turquoise blue faceted bead for the throat chakra with sterling silver rim. 5 mm hole to fit with Pandora or other 3mm chain charm systems. 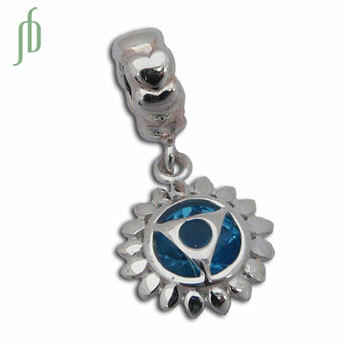 Good vibes throat chakra charm is made of sterling silver and has a turquoise colored stone. The spring clasp makes it simple for you to use it on your favorite necklace or create your own charm blend. It is part of our charmas, good karma charms collection and can be combined with the other charms to personalize your jewelry. This design is available in two sizes. This is the mini size 1.2 cm. Communication. Honesty. Integrity. Sterling silver Throat Chakra Vishudda Earrings with turquoise stone.